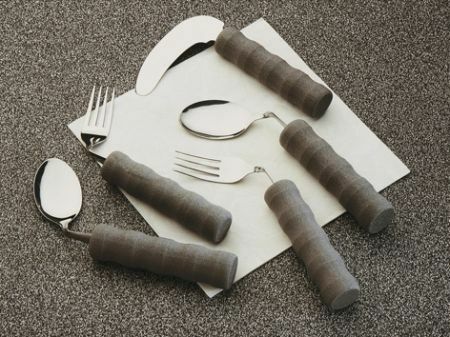 The Angled Cutlery Designed For People With Weak Grip. If you or someone that you care for has a weak grip, reduced dexterity, arthritis, or some other hand or wrist issue, then you'll appreciate the difficulties associated with self-feeding trying to use traditional cutlery. We offer a wide range of angled cutlery specifically designed with these issues in mind. Our angled knives have blades angled at 90° that allow use without cocking the wrist with a rocking action, and the fork and spoon are available as right or left handed versions. Ideal for people with rheumatoid arthritis like myself. The angle takes a bit of getting used to, but once you master it, it makes life so much easier!!! Thank you. A very comfortable,easy clean grip,and the angle of the cutlery is perfect for someone with low arm/wrist movements. My daughter has no muscle tone and has a weak right hand side. She finds these easier than normal cutlery. Very recommended. everything arrived in the estimated time. I would recommend using them again.